There are a number of great books on the Mayflower pilgrims. This includes modern contemporary books as well as primary sources written by the pilgrims themselves. These books cover everything from the pilgrim’s early days back in England to the Mayflower voyage to the settling of Plymouth colony and beyond. They help shed light on these fascinating and complex people as well as the world they lived in. 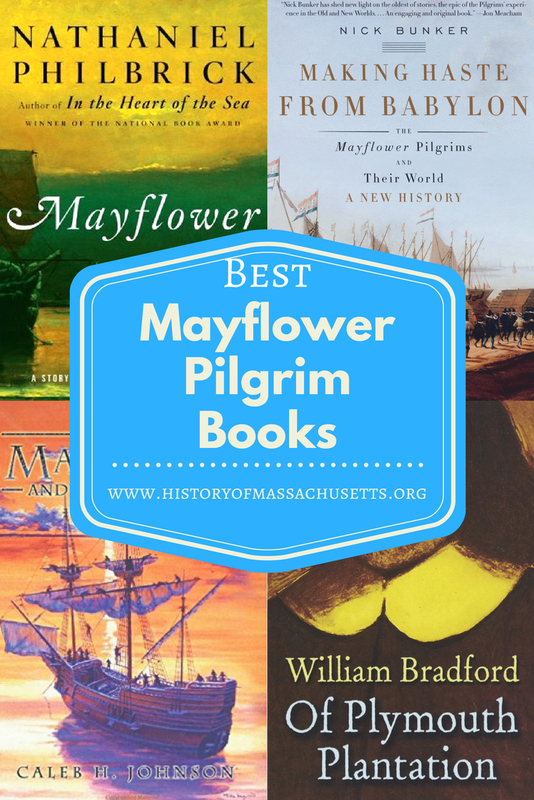 These books listed here are also some of the best-selling books on the Mayflower pilgrims and have received great reviews from literary critics and historians as well as from readers on sites like Amazon, Goodreads and etc. I’ve also used many of these books for research for this website so I can personally say they are some of the best on the topic. Published in 2006, this book by Nathaniel Philbrick explores the voyage of the Mayflower and the settling of Plymouth colony. The book was a Finalist for the Pulitzer Prize in History and was one of the New York Times Book Review Top Ten books of the Year in 2006. Nathaniel Philbrick is an award-winning author who has written numerous books on American history such as In the Heart of the Sea: The Tragedy of the Whaleship Essex; Bunker Hill: A City, A Siege, A Revolution; Valiant Ambition: George Washington, Benedict Arnold and the Fate of the American Revolution; The Mayflower and the Pilgrim’s New World. Philbrick has won many literary awards, such as the 2000 National Book Award for nonfiction, 2003 Theodore and Franklin D. Roosevelt Naval History Prize, 2003 Albion-Monroe Award, 2007 Massachusetts Book Award for nonfiction, 2010 Montana Book Award Honor Book, 2011 ALA Notable Book, 2013 New England Book Award, 2014 New England Society Book Award, 2014 Distinguished Book Award of the Society of Colonial Wars, 2017 George Washington Book prize, 2017 James P. Hanlan Book Award and the 2017 Harry M. Ward Book Prize in addition to countless other awards from various historical societies, genealogical societies and history museums. Published in 2010, this book by British author Nick Bunker explores the prehistory of the Mayflower pilgrims and their first decade at Plymouth to try and uncover who they really were and what motivated them to come to the New World. Using previously unused British archives, documents and church records, Bunker argues that the pilgrims were not so much religious refugees as they were Christian missionaries on a quest to spread Christianity to the New World. Bunker also argues that separatism “was never the creed of the penniless” and that these pilgrims were actually savvy businessmen and entrepreneurs who wanted to capitalize on economic opportunities in the New World. The book received good reviews when it was first published, with many reviewers praising its impeccable research, but many also pointed out that Bunker is a better researcher than a storyteller. Nick Bunker is a former newspaper reporter and investment banker and author of a number of books on American history, including An Empire on the Edge: How Britain Came to Fight America; and Young Benjamin Franklin: The Birth of Ingenuity. Bunker was a finalist for the Pulitzer Prize for History in 2015, for his book An Empire on Edge, and won the 2015 George Washington Prize. Published in 2005, this book explores the personal histories of the Mayflower passengers as well as the history of the ship itself. The book consists of short biographies on each of the Mayflower families and individuals, tracing them from their baptism to their travels to Holland and the New World to their deaths in Plymouth. The book also includes a brief history of the Mayflower ship using Admiralty Court records and customs records. Caleb H. Johnson is the author of two history books, The Mayflower and Her Passengers and Here Shall I Die Ashore: Stephen Hopkins, Bermuda Castaway, Jamestown Survivor and Mayflower Pilgrim, and is the creator of the website MayflowerHistory.com. Published in 2017, this book is a biography of Mayflower pilgrim Edward Winslow and his family. The book traces two generations of the Winslow family, beginning in 1595 with Edward Winslow’s birth in Droitwich, England and ending with the final actions of Penelope Pelham Winslow in 1703. In doing so, the book explores what Edward Winslow’s life was like in England and Holland, why he made the Mayflower voyage and what he and his family did in the New World. Fraser is a British historian and author of numerous books on British history and historic figures, such as The Story of Britain: From the Romans to the Present; A People’s History of Britain; Charlotte Bronte: A Writer’s Life; Bronte’s: Charlotte Bronte and her Family. Fraser is also the former President of the Bronte Society. Published in 1856, this book by Mayflower pilgrim William Bradford is a chronology of the pilgrim’s lives in England, Holland and America. Bradford wrote the manuscript between the years 1630 and 1651 and recorded everything from the pilgrim’s experiences living in the Netherlands, to their voyage on the Mayflower and their daily life in Plymouth colony. Bradford never published the manuscript in his lifetime because it was intended to be a public journal that was to be passed down to future generations of puritans to show the sacrifice the pilgrims made for their religion. The manuscript remained in the Bradford family until 1728 when it was deposited in the New England library, which was located in the steeple of the Old South Meeting House, in Boston, Mass. The manuscript then went missing sometime in the late 1700s, possibly stolen by looters during the Revolutionary War, and remained missing for over half a century until it was discovered in the Bishop of London’s Library in Fulham, England in 1855. The manuscript was published the following year and, due to its description of the First Thanksgiving at Plymouth, sparked a sudden interest in the Thanksgiving holiday. The book is considered the most important narrative of the 17th century and is the first American history book ever written. First published in 1624, this book chronicles the colonist’s second and third year at Plymouth. The book was written as a promotional material to inform investors and other separatists about the colony’s progress. One of the main things Winslow aimed to do with the book was convince the colony’s investors that the colonists had friendly relations with the Native-Americans and, therefore, had gained access to trade goods. He also hoped to explain that some of the colony’s struggles were not due to laziness, incompetence or divine judgement but were a result of harsher weather and fewer food supplies than expected. Winslow also aimed to reassure the group’s religious leaders back in Holland that the group had retained their Christian and English identities in this new land and that the progress they had made was an indication of god’s approval of their colony. Wisecup argues that this nuance is apparent when Winslow sometimes complicates his own narrative of providential signs and future prosperity with tales about how the colonists preemptively attacked the Massachusetts tribe, which undercut claims that the colonists were living in peace with the local natives and raised questions about why the colonists resorted to violence, and with Winslow’s acknowledgements of concerns regarding the Algonquin’s military and political strength and the fear that they might form an alliance and attack the colony. In addition, Winslow also includes notes and observations on the native’s gods, even though he had stated in a previous report that the natives had no religion, and provides descriptions of the native’s cultural practices, which he obtained during conversations with them. In these descriptions, Winslow often repeats the phrase “they say” which acknowledges these sources as speakers rather than objects, thus humanizing them. It is for these exact reasons that the book is considered a comprehensive, complex and fascinating firsthand account of the colony’s early history. Published in 1963, this book is about a visitor’s observations of early Plymouth. The book features a series of letters from an Englishman named Emmanuel Altham, a Dutchman named Isaack de Rasieres and a Virginian named John Pory. The letters describe what the men saw during their visit to Plymouth, between the years 1622 and 1627, observing everything from the people, the landscape and important events. The letters include descriptions of the settlement’s fort and clapboard houses, the number of livestock, the structure of the colony’s government, the customs of the local natives, as well as events like Miles Standish’s expedition against the Wessagusset and William Bradford’s wedding feast complete with notes on his notable wedding guests like Wampanoag leader Massassoit. The letters are so detailed that the current Plimoth Plantation museum was actually built partly from the specs in these letters, which describe everything from the height of the gate posts to the number of goats in the colony. The book is a considered a valuable outsider’s perspective of Plymouth colony, its colonists and its indigenous neighbors. Published in 1622, this book was probably written by Edward Winslow, although parts have been attributed to William Bradford, and it chronicles the pilgrim’s first year at Plymouth. It was written as a promotional material to entice other colonists to come to Plymouth. The book, which is better known by its short title, Mourt’s Relation, was written between November of 1620 and November of 1621 and describes events such as the signing of the Mayflower Compact, the first landing at Cape Cod, the settling of Plymouth, the First Thanksgiving and the arrival of the ship Fortune. The book is important because it is the earliest firsthand account of the pilgrim’s experiences. It was written a decade before Bradford began writing Of Plymouth Plantation and was published 234 years before it. Published in 1986, this book is a comprehensive history of Plymouth colony from its very beginning until it was merged with the Massachusetts Bay Colony in 1691. The book includes a chronological and topical history of the colony as well as more than 300 biographical sketches of the colonists. The book also includes maps, photographs and transcripts of important documents. This book is considered an invaluable resource for historians, genealogists and anyone interested in learning more about Plymouth colony. Judson, Allen B., and Sydney V. James. “The New England Quarterly.” The New England Quarterly, vol. 37, no. 2, 1964, pp. 279–281. JSTOR, JSTOR, www.jstor.org/stable/364026. I’ve read of few of these, mostly recently Rebecca Fraser’s book, which I couldn’t put down. Wonderful reading.